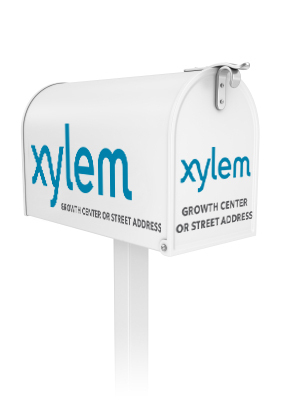 Mailbox Graphics | Xylem Inc. In many instances, building signage may not be visible or obvious from public roadways. The first indication of the facility a person sees may be a rural mailbox. Use one of the two downloadable designs and work with a local vendor to produce weatherproof decals or another suitable application for your mailbox. We have developed graphics that can be applied to a standard 7.5 inch (19 cm) wide, 9.5 inch (24 cm) high and 20.5 inch (52 cm) deep rural U.S. mailbox. The “Let’s Solve Water” tagline is not used to ensure visibility and readability of the logo at a distance. 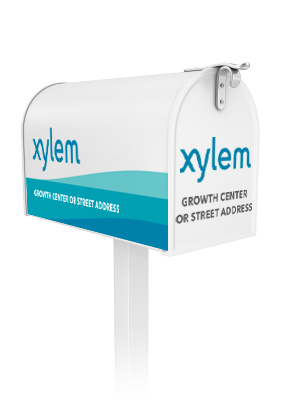 Inclusion of your Growth Center or street address is optional.